IEEE CIS/SMC Ottawa Joint Chapter - Welcome! 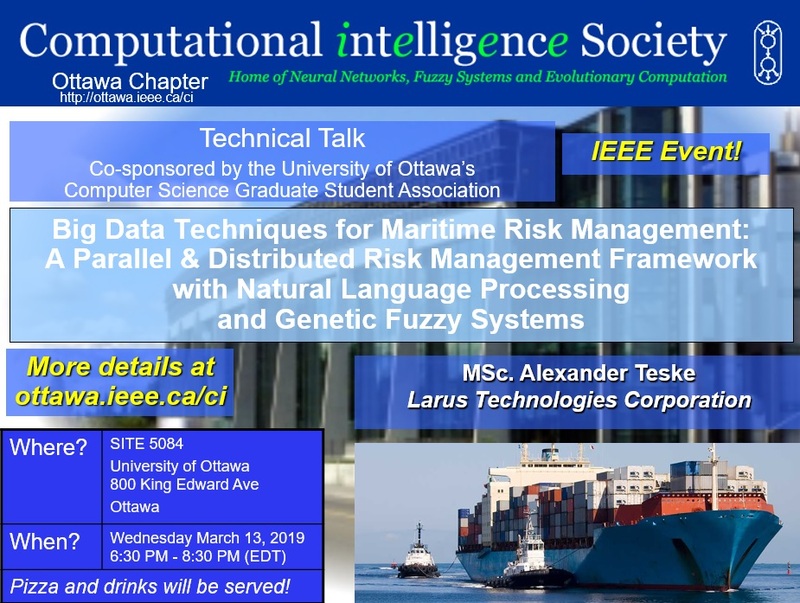 Welcome to the website for the IEEE Computational Intelligence Society (formerly known as the IEEE Neural Network Society) and the Systems, Man & Cybernetics Ottawa Joint Chapter. You can consult our list of past and present meetings/events and get in touch with the chapter officers. We are trying to build up this chapter to become the meeting place of choice for the computational intelligence and systems, man & cybernetics communities in the Ottawa region, so if you are involved in research or industrial activities that fit our scope, please do not hesitate in contacting us. You may either be invited to present your work at one of our technical events, or at the very least be provided with a link to your project web page from this web site. Finally, we are planning to conduct at least four activities per year, so we hope you can join us at those events. Let us know your feedback about our website. We would love to hear from you! Check out our chapter's past events page. Check out the section's news and events page. � Copyright 2005-2013, IEEE. Terms & Conditions. Privacy & Opting Out of Cookies.